For a start,there is no woman on the photo. Hair decoration etc would suggest Ute, as would the photographer and location and the style of fringed shirt. I must agree with you -- there did not appear to be any women in this photograph; however, I am not an expert in this area so I wasn't going to make any absolute declarative statements. The key may be in the "Charlie" Spotted Tail. None of the Spotted Tail references I found ever mentioned the name "Charlie." Plus, rifles and cartridge belts appear to be a prominent theme with these Utes, as I thought Spotted Tail was a peace-maker. 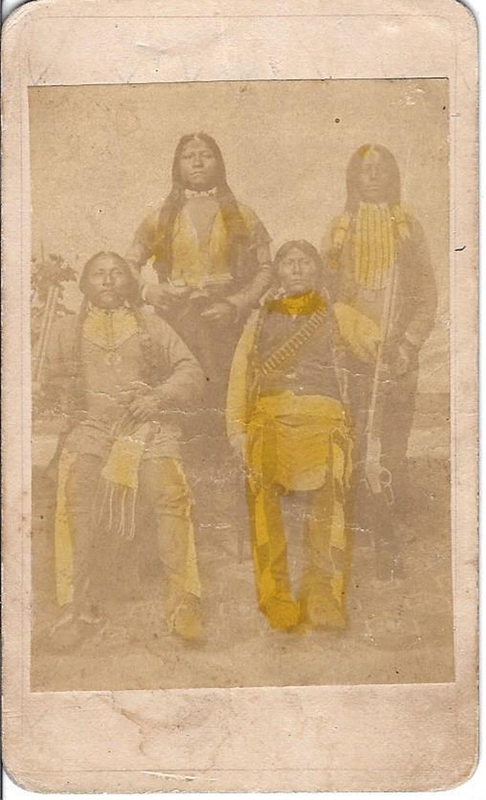 He was as far as the white were concerned but he was still fighting other tribes, like the Pawnee. 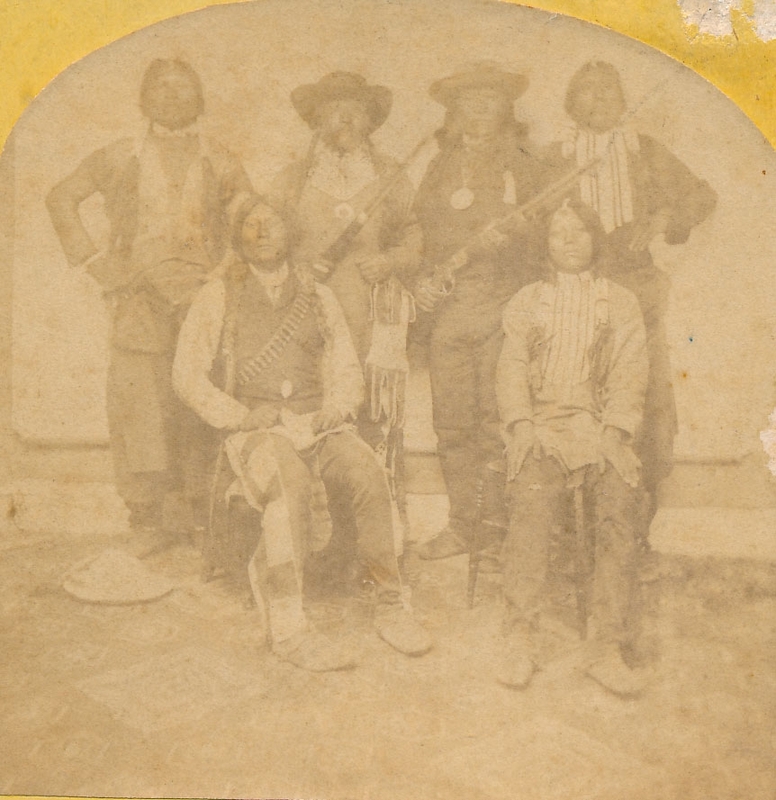 I assume that the man sitting on right (front) in Brian´s photo and the man sitting left in my photo is Ute Chief Antelope aka Wanzito. Is this the same Chief Antelope who was involved in the Meeker incident at the White River Agency, Colorado? Yes, it is said that Antelope was in the Meeker incident. 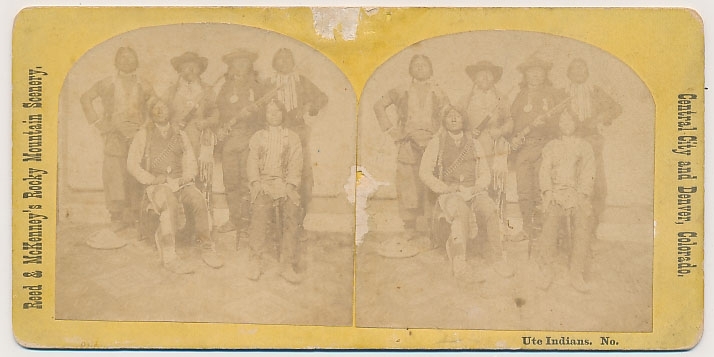 The man sitting left in the first post by Brian... he resembles Ute chief Guerro, I think. In the other two photos he wears a hat. Unfortunately all photos are somewhat blurry, so it´s hard to say 100 percent.